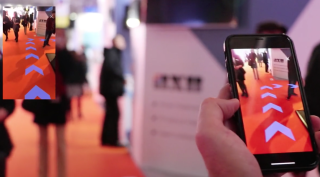 22 Miles has released AR Plug-in, its feature release for mobile wayfinding applications, which it will demonstrate at DSE 2018 in booth 1543. Visitors can now find any destination with a superimposed pathway app from their phone camera. 22 Miles designed this to make mobile wayfinding more intuitive and match the standards set out by the likes of Google Maps. The 22 Miles mobile app capabilities support features such as 3D wayfinding for outdoor campus and interior floor maps; menus, product browsing, and search; smart search directory; meeting and event booking; emergency notifications; social media, surveys, forms and Google Maps for local amenities and offsite locations; indoor positioning support via Bluetooth beacons (BLE) and Wi-Fi access points; and of course, augmented reality route visualization (AR) plug-in. To expand further on the AR Plug-in, users can get promotions in real time throughout their navigational experience, as notifications alert them of deals within their proximity. The plug-in can integrate with existing organizational apps, and 22 Miles offers app design services for end users.